A staggering US$3.5 billion can hit a potential loss in the Philippine economy due to cybersecurity incidents according to Microsoft’s recent study. This is 1.1 percent of the Philippines’ total GDP. The study by Frost & Sullivan, as commissioned by Microsoft, is titled “Understanding the Cybersecurity Threat Landscape in Asia Pacific: Securing the Modern Enterprise in a Digital World”, aims to provide business and IT decision makers with insights on the economic cost of cybersecurity breaches in the region and identify the gaps in organizations’ cybersecurity strategies. The study involved a survey of 1,300 business and IT decision makers ranging from mid-sized organizations (250 to 499 employees) to large-sized organizations (>than 500 employees). The study reveals that more than half of the organizations surveyed in the Philippines have either experienced a cybersecurity incident (18%) or are not sure if they had one as they have not performed proper forensics or data breach assessment (34%). Cybersecurity attacks have resulted in job losses across different functions in seven in ten (72%) organizations that have experienced an incident over the last 12 months. 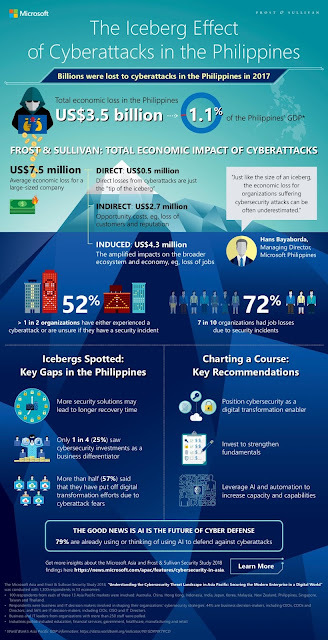 In addition to financial losses, cybersecurity incidents are also undermining the Philippines organizations’ ability to capture future opportunities in today’s digital economy, with more than half (57%) respondents stating that their enterprise has put off digital transformation efforts due to the fear of cyber-risks. Although high-profile cyberattacks, such as ransomware, have been garnering a lot of attention from enterprises, the study found that for organizations in the Philippines that have encountered cybersecurity incidents, data exfiltration and data corruption are the biggest concern as they have the highest impact with the slowest recovery time. Lacking cybersecurity strategy: While more and more organizations are considering digital transformation to gain competitive advantage, the study has shown that 46% of respondents see cybersecurity strategy only as a means to safeguard the organization against cyberattacks rather than a strategic business enabler. A mere 25% of organizations see cybersecurity strategy as a digital transformation enabler. In a digital world where cyberthreats are constantly evolving and attack surface is rapidly expanding, AI is becoming a potent opponent against cyberattacks as it can detect and act on threat vectors based on data insights. The study reveals that more than almost four in five (79%) organizations in the Philippines have either adopted or are looking to adopt an AI approach towards boosting cybersecurity. For a cybersecurity practice to be successful, organizations need to consider People, Process and Technology, and how each of these contributes to the overall security posture of the organization.